January can always be a bit of a rubbish month, when post Christmas (and for me birthday) blues really kick in. But this year, to try and keep the blues at bay, I am heading off on a couple of city breaks – I know, any excuse! Packing for a city break can always be tricky, especially if you are flying with just a cabin bag – and I had planned a big trip to Boots to stock up on all my travel size essentials in preparation. 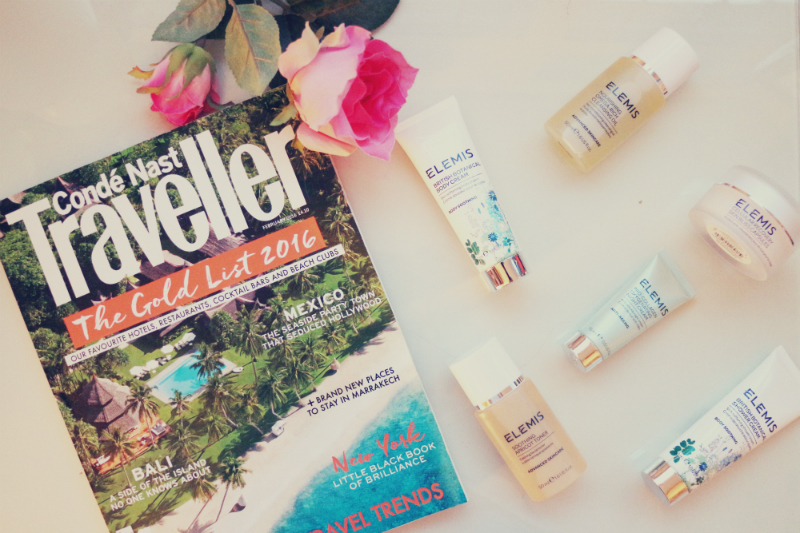 You can imagine my excitement then, when an email popped into my inbox from the beauty team at Debenhams asking if I would like to try out the Elemis Luxury Skin and Body Traveller Skincare Set – seriously perfect timing! Contained in the set is everything you would need to give your skin a bit of luxury on the go including the Nourishing Omega-Rich Cleansing Oil, Soothing Apricot Toner, Cellular Recovery Skin Bliss Capsules, Pro-Collagen MarineCream, Pro-Collagen Oxygenating Night Cream, British Botanical Body Cream and British Botanical Shower Cream. I have been a bit of an Elemis fan for a while so had tried a few of the products before, but I haven’t used most of them for a while and after far too much chocolate and cheese over the festive period my skin was in need of some loving! The first things I tried out were the three step products for the face. The apricot toner and the marine cream have been favourites of mine for a while, working together to leave my skin feeling super fresh and clean without being too harsh. The toner in particular I love as it has calming properties, which helps to keep my redness at bay. The skin bliss capsules I had also tried before and they are incredible! The morning rose capsule and the nightime lavender capsule work together to completely de-stress the skin by breaking down all the toxins that build up during the day. One thing that I hadn’t tried before was the cleansing oil and as my skin type is combination I wasn’t sure this would be right for me but I was actually really pleasantly surprised. Although it’s an oil, the cleanser didn’t leave my skin feeling greasy at all and my face felt baby soft once I had rinsed it off! But my favourite of the bunch has to be the body and shower cream. Made with milk proteins, enchium oil and essential oil of lavendar, chamomile, geranium and palmarosa it smells amazing and leaves your whole body feeling super soft and chilled. This would be the perfect pick me up teamed with a hot shower after a flight! 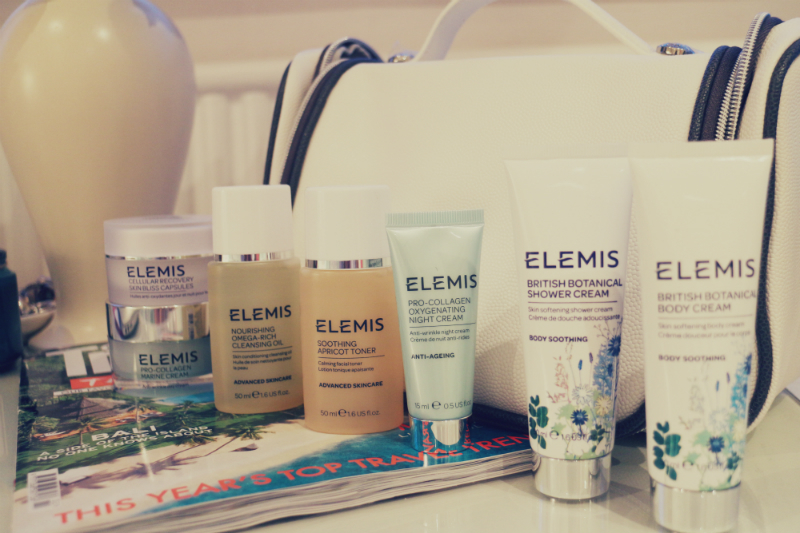 All of the products contained in the set are under compact and under 100ml, meaning they are perfect for taking with you in your hand luggage and they all come in a gorgeous Elemis toiletry bag, meaning you can keep everything you need in one place. Mine will definitely be my new best friend over the next few weeks! Have you ever tried any Elemis products? What skincare essentials do you pack in your case? *This product was sent to me on a complimentary basis for review, however all opinions are my own.